This is the kind of place that most of the blog-reading world would steer clear of because of its facade – and I love it. I had driven by this fish market shack several times before finally stopping in today. It is a small take-out-only spot decorated with hand-written posters advertising lots of seafood meal specials. The prices are crazy-good. Fresh fish and seafood is also sold here. I had the plain fish (lake trout) sandwich. 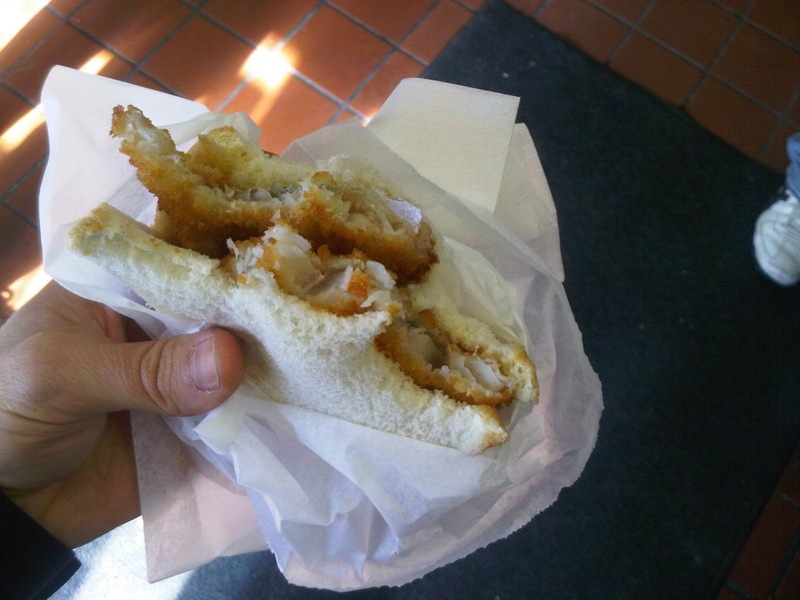 The fish was fresh, breaded, fried and good. The sandwich is served on plain white bread. I loved this sandwich – in part because I was enamored with the dingy character of the restaurant, but mostly I like it because it was just plain good food cheap. I gave this whole place 729 out of 731 possible points. King’s Fish Market is on 12 E. Marshall St. in the Jackson Ward section of Richmond. That sounds and looks really good. Even though I am afraid of hole-in-the-wall seafood places, admittedly.sidenote: you should add on the CanCan page that their vanilla capuccinnos are out of this world good. Hey, I love fish dumps like this and work around the corner. I’ve gone in but didn’t order. How were the fries? Crunchy? I didn't try the fries, my friends liked them though! Thanks man, I’m there Monday. 20 years ago I used to meet a buddy of mine every few months downtown at a place called King’s for a fish sandwich & tall boy. I too had fallen under the spell of the Asian fish market haunt of crusty broken men and fish pilgrims crossing paths on a bus transfer across town. But in my day the fish was good but sometimes previously frozen & I eventually decided that I would search for a better 3 piece fish sandwich on white bread to put my Texas Pete on. Hmmm, you say it’s on Marshall. Mine was on Broad. Could it be the same folks? I’m gonna have to go find out. I\’d love to know if it is the same place. the place on broad is still open! not the same people but nearly identical menu, prices and quality!